We are overwhelmed with the gratitude and letters we have received! 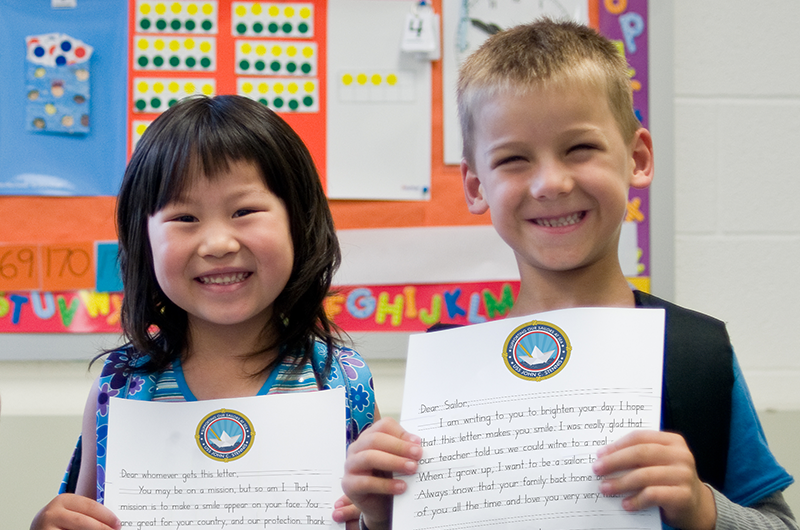 On January 22, Learning Without Tears launched a letter-writing campaign in celebration of National Handwriting Day to say thank you to the sailors on our adopted US Navy ship, the USS John C. Stennis. Our aim was to help students in school districts across the nation send handwritten notes of thanks to the sailors at sea. The response was overwhelming—students from over 1,000 classrooms, including homeschoolers and occupational therapists, wrote letters. With the help of our partner, VetAdvisor®, we are packing up over 15,000 letters to send off to our ship! The letters will take a journey of almost two months to reach the ship, which is in the middle of a 16-month deployment. Students embraced the program with enthusiasm, drawing pictures, asking questions, making Valentine's Day cards, and, of course, practicing handwriting. By Elizabeth FeldmanElizabeth earned a B.A. in Government and Politics from the University of Maryland. After many years of marketing and project management consulting for companies including Blackboard, International English Language Testing System (IELTS), and Remote Learner, she is now with Learning Without Tears.